Fifteen year old Marli Hamblin was sunbathing in her family's driveway Friday when her sister backed out of the garage; driving over her head and causing her death. Marli Hamblin, 15, was wearing headphones and listening to music Friday while lying on a blanket in the driveway of her home in Syracuse, Utah, Fox 13 reported. At around noon, Hamblin’s older sister backed out of the garage in a truck and, not realizing her sister was there, backed over the girl's head. Hamblin suffered head injuries and died Sunday afternoon. The victim, who had four siblings, enjoyed playing piano and had just made the cheerleading team at Syracuse High School, KUTV reported. 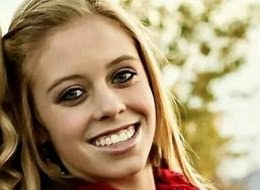 “She was always smiling and she was just spunky,” her aunt, Noelle Kelley, told the Standard Examiner. Her family announced they will be donating the girl’s organs. Labels: Cringe Worthy, RIP, Seriously? ?